Fruitcake. You either love it or hate it. I am betting that most people who hate it have only had bad boozy doorstops filled with nasty candied fruit in unnatural colors. I know that I was never much of a fruit cake lover until I discovered this recipe. 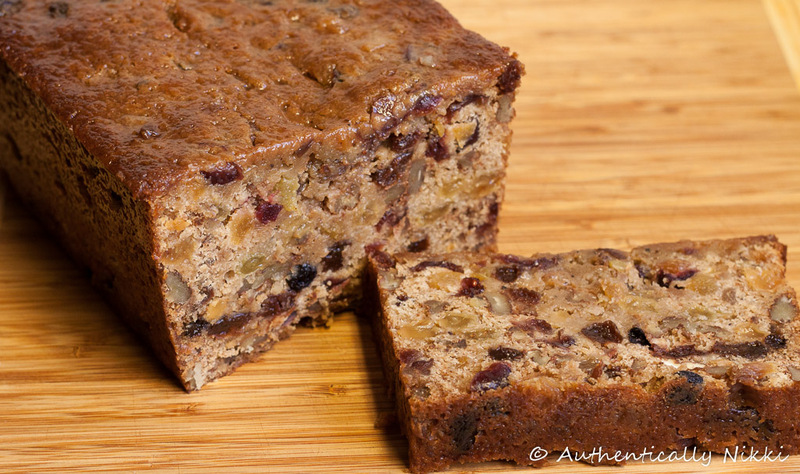 Several years ago I saw an episode of Good Eats on the Food Network and Alton Brown opened my eyes to what fruitcake can and should be, a moist and spicy cake made with only dried fruit and nuts. I have also reached a point in my life where buying Christmas presents for family is reserved for the nieces and nephew. So what to do for the sisters, in-laws, parents and grandparents? Bake. Cookies, biscotti and fruitcakes are their presents. If you want to gift fruitcake, this recipe makes 6 mini loaves or one large loaf (to keep for yourself!). I usually make these the weekend after Thanksgiving to allow plenty of time for them for them to mature in the refrigerator. They really benefit from a 4-6 week rest before serving. Not that that stops my husband from begging for a slice the minute they come out of the oven. Homemade fruitcakes can also suffer from an overabundance of brandy which can turn some people off. If you like a strong, boozy taste to your fruitcake feel free to baste the finished product with straight-up brandy or rum. However, if you prefer a lighter touch, basting with a rum simple syrup is the way to go. Why rum and not brandy? Well, it is just personal preference, I like rum (a lot!) and would rather use it than brandy. The advantage of the simple syrup is that it really allows the taste of the cake to shine while keeping it moist and adding just a hint of rum flavor. By all means, use what you like and make it as strong as you like. After all, it is your fruitcake. So stir up a batch the weekend after Thanksgiving and try not to snitch any cake until Christmas. If you make it for gifts, they will be very much appreciated and may even convert a few fruitcake haters into beggars.